Spider-Man Vs. the Sinister City Limited Edition Art Print Just Released from the UD Gallery! New Web-Slinger masterpiece is a must-have for Spidey collectors! Just in time for the holidays, the Upper Deck Gallery has announced a new addition to an already impressive lineup of premium poster prints. 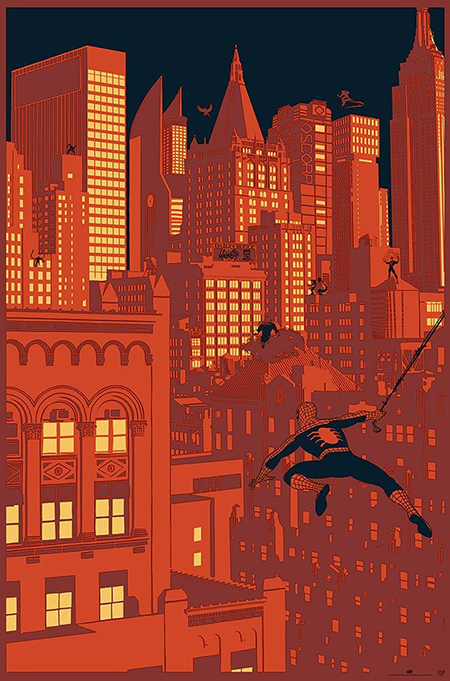 The latest is a silk screened illustration that features the amazing Spider-Man, facing a sinister cityscape that has been infested with some of his most notorious enemies. 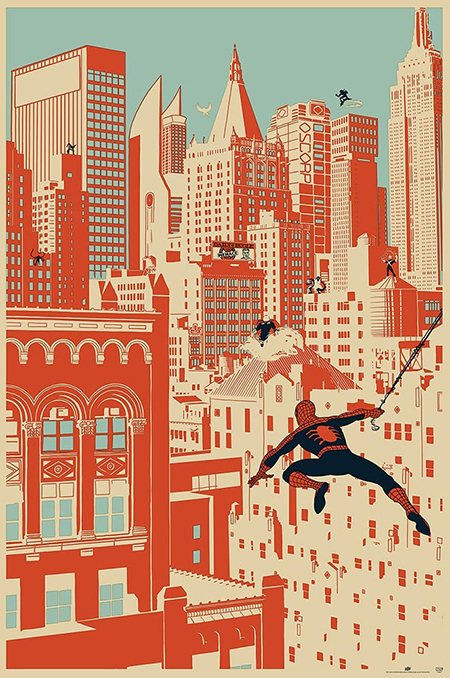 This incredible 24×36” print captures Spidey Swinging into action to protect the city he loves. Created by Chris Thornley (who designed San Diego Comic Con’s Exclusive sold out Daredevil print for the UD Gallery) features a fascinating landscape full of subtle, tactile detail where buildings seem to bleed into one another and villains are cleverly tucked away into almost every corner. The understated monochromatic coloring and sleek design makes this incredible piece of silk-screened art perfect for almost any room or office. Each print is hand numbered to 250 and comes with a signed Certificate of Authenticity. Spider-Man Vs the Sinister City is now available exclusively at www.UpperDeckGallery.com for $59.99. For fans that prefer the darker side, a rarer short print edition takes the image to new heights with a daunting black sky that gives the buildings an almost fiery effect and adds an entirely different dimension to this intricate illustration. The variant print is hand numbered to just 100 and is available exclusively at www.UpperDeckGallery.com for $99.99, while supplies last. Each variant print comes with a signed Certificate of Authenticity. Collectors can view the entire UD Gallery portfolio, including Wolverine Kuzuri, Avengers Origins, Gangs of New York, The Crow and more at www.UpperDeckGallery.com. UD Gallery is a collection of premium prints that feature unique artwork of fan-favorite comic and movie characters. All prints are limited-edition, one time print runs of incredible illustrations created by today’s top-tier artists and come with an original Certificate of Authenticity. For more information about the UD Gallery and upcoming releases, visit www.UpperDeckGallery.com.